Follow along for St. John’s vs Arizona State live updates of the NCAA’s First Four game. Tip-off scheduled at 21:10 ET. We are just five minutes away from this game's tipoff! It is St. Johns vs Arizona State, but really it's Chris Mullin vs Bobby Hurley. Two great NCAA tourney legends from back in the day. This is how Arizona State's uniform will look like with the NCAA blue patch. St. John's Red Storm has arrived at the arena. In less than an hour, St. John's and Arizona State will kick off the NCAA Tournament in Dayton, Ohio. In a moment we will share St John’s vs Arizona State live starting lineups, in addition to the latest information that surges from the UD Arena. Do not miss a detail of the match with the live updates and commentaries of VAVEL. The last meeting between both goes back to December 2017 in the Basketball Hall of Fame Classic. The Sun Devils defeated St. John’s 82-70 in a game lead by Romello White’s performance with 22 points and nine rebounds. ASU’s regular season finished 22-10 overall (12-6 in Pac-12). In the Pac-12 Tournament, the Sun Devils fell to Oregon in the semifinals. The Johnnies had a 21-12 season (8-10 in the Big East). Mullin’s team lost to Marquette in the second round of its conference tournament and holds four losses in the last five games. St. John’s Red Storm (21-12) will be facing Arizona State Sun Devils (22-10) in the NCAA First Four, for a chance to meet Buffalo on Friday afternoon. The St. John’s vs Arizona State game will be played at the UD Arena in Dayton, Ohio. Tipoff is scheduled at 21:10 ET. 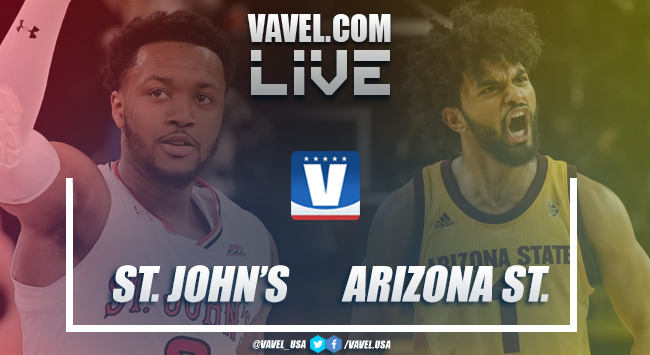 Welcome to VAVEL USA’s LIVE coverage of the 2019 NCAA First Four: St. John’s vs Arizona State! My name is Noel Alberto and I’ll be your host for this game. We will provide you with pre-game analysis, roster updates, and news as it happens live here on VAVEL.